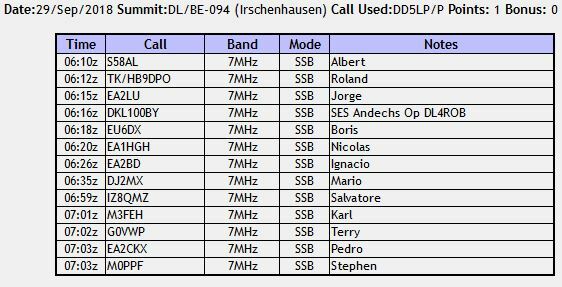 DD5LP/P – November 1st 2018 – DL/AM-058 Hinteres Hoernle – or another success with the HF-PRO-2. For a few days twenty metres has been performing surprisingly well (at least compared to the last year or so). November 3rd sees the annual NA-EU S2S event now renamed to the transatlantic S2S event as we had hoped some South American activators may join in. 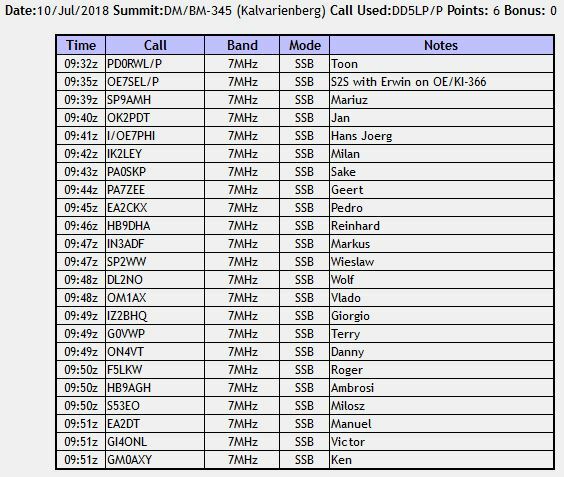 I had originally planned this summit for that event, however over the last week, because of high wind the seat lift has not been running one day and OK the next, so this was a risk for the big event and I chose to activate Hesselberg DM/BM-145 instead. As November 1st is a holiday in most of germany, I decided that one last test after changing the power supply box to no longer use the noisy “Buck converter” unit and building a new cardboard shade for the X108G’s – unreadable in sunlight – display, would be a good idea and if the seat lift is running, then why not Hinteres Hoernle? The equipment would be the X108G and battery box and headphones with the standard 6m mast and two wire dipoles plus my tripod and the Kommunica HF-PRO-2. Also water and all the usual fix it bits. Normally this would go in a small rucksack and a photo bag but this time I decided that as I would be taking the seat lift one rucksack with anything would be a better idea. So I dug out my full-sized rucksack, that I know the photo bag fits exactly in its bottom section and everything else went in the top section. Everything that is apart from the 6m mast and the HF-PRO-2 which even when taken apart is still over a metre long. these went strapped onto the two sides of the rucksack. This has the advantage that the antenna doesn’t stick out “too” far above the rucksack. Great idea I thought and all was ready for the next day, where I had planned a casual 1pm departure with a 1 hour drive to the valley station of the lift and then, I was thinking a 15 minute ride up the mountain and then a casual 15-20 minute walk to the summit, right ? … wrong! Read further. Before I set off at 12:40pm I was having second thoughts about the large rucksack. It appears putting the contents of two bags into one bag makes that bag weight 50% more than the combined weight of the two bags alone – too late now, I’ll have to manage. The drive down to Bad Kohlgrub went without incident although a new bridge and some changed road junctions at Bad Kohlgrub may confuse some GPS Navis if they’re not up to date. I arrived at the Bad Kohlgrub valley station of the lift at 1:30pm and managed to get one of the last free parking spots. it looks like a lot of people had decided to visit the mountains on this public holiday. Well the journey nearly ended before it started. While getting into the moving seats I nearly fell but luckily the attendant grabbed me from behind, by the collar, and pulled me back into the seat and I then manhandled the very heavy rucksack onto the seat beside me. That rucksack was far too heavy! Later, on the trip down the attendant took the rucksack off me and put it in the seat next to me before the seat reached me for getting on. Getting off this lift at either the top or bottom is very simple – you just stand up and the seat splits in two and goes around you. What a neat system! Anyway, I’m now on the lift catching my breath after the near accident and looking at the time. I had forgotten to ask when the lift stops working – I know the last ride up is at 4pm, but what about coming down – I must ask when I get to the top… I forget to of course! The lift takes ages to get up the mountain but it’s nice saying hello to the people passing you going back down to the village having been at the restaurant at the top of the lift for lunch. It’s cold but sunny and getting warmer all the time – of course I have my thick winter jacket on, something that over time I will regret. Once we reach the top I disembark without any problems, exit the lift station and take a few photos before heading off in the direction of Hinteres Hoernle. I think I’m running late for my schedule and it’s only after walking for about ten minutes that I realise that I forgot to check when the last lift would be going down. Oh well, I’m not going back, I’ll just have to be back their by 4pm to be certain of a ride down – otherwise it’s an up to 4.5 km walk down the mountain depending upon the route taken. I now see the signpost saying I have a 40 minute walk in front of me, so I press on, that is until I come to a fallen tree that is totally blocking the track. If I didn’t have the rucksack I could have climbed over or through the tree branches as I saw someone else do but with the rucksack with the antenna pointing out of the top of it, no chance. So I had to scramble up the hill a little then cross behind a copse of trees and then get back down to the track. I could see by the number of footprints, this is what many people had already done today. In my usual style I kept pushing on, passing lots of people and only occasionally stopping to catch my breath on some of the steeper parts. The sign on the path says to always stay on the main path but as Hinteres Hoernle came into view it was obvious everyone was simply going straight up the side of it as the route is far shorter than the one I had taken a year ago, so I did the same. I had taken almost exactly 30 minutes from the lift to a flat patch just down from the Holy Cross on the very summit, where there was room to set-up without obstructing anyone as it was quite busy by this time. This was about 2:30PM. I decided initially to set up for 20 metres as that was the band I was hoping would be open and the fact that the tripod and HF-PRO-2 was the quickest antenna to set up and needed the least space. I had them set up and the rest of the gear unpacked in about 15 minutes. I spotted and started calling CQ SOTA and to my surprise my first chaser was N4EX, Richard in North Carolina. More contacts followed and in the end I had two US contacts, one from Northern Ireland, one from Cornwall (south-west England), one from Sweden, one from Greece and two German station contacts, all in just over 10 minutes. 20m was playing good again. I might have bagged some more contacts but a couple with a dog came along and expressed some interest, so I bent their ears about Ham radio for about 10 minutes. Not the dog – he got bored and went off to explore on his own on the top of the “Hinteres Hoernle” mountain. By the time I finished that conversation, I put out another couple of CQ calls and as there was no reply, I started to pack up as I was running short on time to get back to the lift. I had everything packed by 3:30pm and was heading back to the lift where I arrived as planned right on 4pm to find they were still going to be operating until 10 to 5. Oh well! Time to settle in for a calm 30 minute ride back down the mountain and think about what had been achieved. I was blessed with sunny weather, which as I had dressed for the cold meant I sweated a lot on the climb up with the heavy back-pack! I had forgotten how far the summit was from the top of the chair lift and that along with the slow lift meant my time on the mountain transmitting was limited but at the end it was a lovely day out. New cardboard sunshade for the X108G display. The Good: With the diodes dropping the voltage in the battery box in place of the buck converter there’s no more RFI from the box. Activation achieved with just the new Komunica HF-PRO-2 antenna – I did not need to put up the mast and dipole to get contacts. The Bad: The new cardboard sunshade didn’t help at all …. but …. I found that standing the full-sized rucksack behind me (and so blocking the sun) did work and I could read the display. Now I don’t intend carrying the large rucksack to any more summits but perhaps I can work out some other kind of lightweight screen that I could set-up behind me using my hiking sticks (which would also have been useful on this outing but got left at home). The Ugly: Me stumbling along with that rucksack – two lighter bags are better than one over heavy one! DD5LP/P – October 14th 2018 – DL/AM-180 Berndiorfer Buchet. As the opportunity came up to get to Berndorfer Buchet as part of an action to drive the wife somewhere and while I had just managed to match the Antron A-99 (CB/10m) vertical on 20m I decided this would be a great opportunity to try everything out before the following Saturdays UK/EU <> VK/ZL/JL S2S QSO Party. To support the Antron antenna, I have a large surveyors tripod so it would need to go along as well. to avoid having to struggle up the steep and slippery last part of the track to the actual summit will this extra weight, I did some research to see how far the activation zone extends and where possible find a spot with less trees as the vertical antennas do not perform well between trees. In fact simply walking further along the access track brings one to a more open spot with plenty of space away from trees. Of course I would pack the linked dipole and mast “just in case” something doesn’t work or 20 metres is dead and I need to go onto 40m (which the Antron can’t cover even with matching components. A nice coincidence was that the 100 Watts and a Wire “FALLOUT” event was also going to be on, so I would take part in that as well by mentioning the group on-air as part of my CQ calls, and explain it to anyone who asked. What I was to find out there was another, not so nice, coincidence in that the Scandinavian Activity contest was taking place also up until 1200 UTC and the bands would be full of crocodiles taking part in it (big mouths little ears). 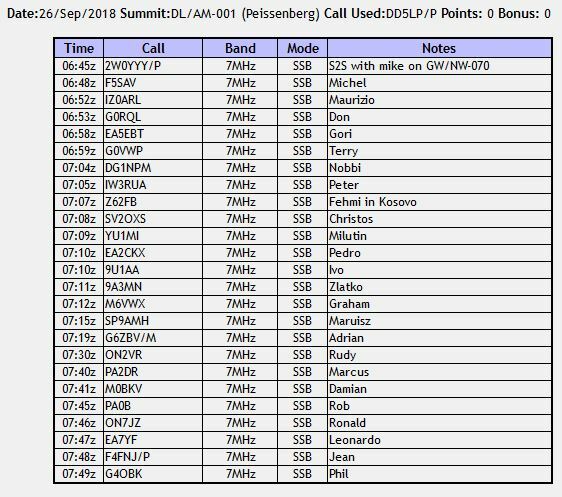 It’s especially a shame when these stations operate in the “non-contest” parts of the bands but no matter which contest it is, no one seems able to take action against these bad contest operators (note not all are bad, mainly it’s the wanna-bees – the top operators are no problem). My timing would be about 0900 to 1000 UTC so too late for any hope of any contacts “down under” this time. So lets see how the equipment works out …. As mentioned above actual set-up location on Berndorfer Buchet was changed because of the heavy vertical antenna but the access is still the same track as is the parking spot on the road down to Kerschlach from the Weilheim to Starnberg B2 road. As I carried all of the extra equipment to the different location, the ideal spot in the grassland seemed to be being worked on, there was a reel of cable there and some other item, so rather than set-up there only to be moved on if the workers came back (unlikely of course as it was Sunday), I decided to set up at the end of a small track, which was certainly better for the vertical antenna than if I had set up by the trig point stone in the forest on the actual top of the summit. after un-packing, I first set-up the Antron A-99 in the Surveyors tripod (pictures below) and then connected up the gear on the laid out painters plastic sheet. As it turned out this was NOT going to be an easy activation! The sunshine! – the display on my Xiegu X108G Chinese HF radio is totally unreadable in sunshine, I set up a lot of things to try to create shade and I had to strain my eyes to get on the right band let alone frequency! The voltage regulator board in my (2x 4S 5000maH LIPO) battery box decided to become a wide band noise generator across 20 & 40m. I’ve had this problem before but thought I had it fixed – it’s back. Even my Cell phone checking in to the cell towers managed to get into my headphones lead to cause audio problems. I set up the Antron A-99 vertical antenna initially to see how it performed but it picked up nothing but noise. Some of this was from the battery box but I think there’s something else on this summit that is also creating electrical noise, (perhaps something underground that was being worked on with the cables on the ground about 10m away from me) which of course vertical antennas are more prone to hear. I didn’t have this problem when I tested the antenna in my back garden. After taking down the Antron and putting up my fibreglass mast and linked inverted-V dipole, I found the BNC plug or the BNC to PL-259 adapter has an intermittent contact, so so careful positioning was needed to get this to stay connected. CONTEST TRAFFIC – both 20 & 40m was full with crocodiles – in principal for a test a contest can be useful but not when a contest station doesn’t even acknowledge you calling and later a station from the same part of the country gives you a 5-5 report – so the contest station can only be bothered with 5-9 signals it seems! DESPITE ALL THAT, I did manage eleven contacts including 4 x S2S contacts (see log below) in just over an hour, by which time it was time to pack up and go and collect my wife. Xiegu X108G Chinese 20w HF transceiver “outdoor” model. Antron A-99 vertical antenna with capacitive matching circuit for 20m. I suppose it was too much to hope for that a newly organised antenna would work in the field without problems on my first attempt however as this model is used to great effect by 2E0YYY from the UK, I was hoping for better than what I got from the Antron. I don’t expect that I will take this antenna for next Saturdays S2S event. It needs some more “normal” activations before it can be trusted to work correctly. I have had a look at the battery box and cannot see anything obvious why it should start and create so much noise on the bands. It did appear to be radiating from the board (over the air) rather than down the power cables, so this will need some work this coming week to try to resolve. The SOTABeams linked dipole “saved the day” again and deserves a new BNC connector on its cable if that’s where the connection problem is – that’ll get checked and replaced if needed. DD5LP/P – July 10th. 2018 – DM/BM-345 Kalavarienberg. From the 10th. through the 17th. of July, I was supporting the World Radiosport Team Championship in Wittenberg, about 6-7 hours drive north of this QTH. I had thought I might get out at some point to accivate a local SOTA summit but as the closest to Wittenberg is probably at least a 90 minute drive away, my idea changed, to doing one en-route, so breaking the driving up as well. I have found that the “Adventure Radio” maps that cover SOTA, GMA, Humps, IOTA and other portable operation programs has a rather nice feature, that the summit information shown on the map has a note as to whether it’s a “drive-up” summit. Which in this case I needed if I was not to lose too much time on the journey. I looked at several possible summits and DM/BM-345 Kalavarienberg was the one I chose. I had hoped to be able to take the magnetic loop antenna and spent a lot of time trying to get it to a reliable state but I wasn’t quite there, so before I took it and had a wasted journey, I decided to take the 6m mast and linked dipole along with the surveyors tripod, which is becoming my preferred support method for the mast. The rig would be the X108-G again. Kalavarienberg is about a 45 minute drive north of Nuremberg and about 10 Km off the A-9 Autobahn that I would be using to head north on to Liepzig and then Wittenberg. The nearest village is Thurndorf. I set off in dry sunny conditions but as I approached Nuremberg the rain started and got heavier and heavier as I got closer to the summit. When I arrived at the summit and parked in the chapel’s car park, the rain was coming in spurts. I wondered whether to wait and see whether it cleared but I was little tight on time, so I decided to put the antenna up and then see if the rain changed it didn’t. as I already had my winter waterproof jacket on, I decided to operate in the rain and probably just “bag” 4 contacts and then call it a day. Well the first three came slowly (this included one S2S) but then there was a flood of calls and that 4 target was well beaten with 23 in the log within 20 minutes. The use of the tripod paid off as it allowed me to locate the antenna close enough for the coax to run to a wooden table and benches near the chapel. Everything got wet but the new pens I have bought indeed kept working in the wet, didn’t smudge or rip the wet paper which I could have rung the water out of by the time I hd finished but rather I put the log page in a place to dry out slowly. I didn’t bother trying 20m after 40m as I wanted to head off on my long drive and dry out a little in the car. Just as I completed taking the station down and packing it in the car, the rain stopped and the sun came out! Typical! In dry weather this would be a nice summit for a family visit, the views without cloud and rain must be really nice and the propagation from there is certainly good. Lambdahalbe 6m telescopic fibreglass mast. The ease of putting up the mast and antenna with the Surveyors tripod far outweighs the problem with its bulk. The X108G now seems to be working well, although the sunshade was certainly not needed this time! In the interim, I have found out that some of my problems with the Mag loop are down to a fault in the Rig Expert AA-30 Antenna Analyser that I use to tune the antenna. So perhaps now that I have the loop re-calibrated I’ll take it to a simple summit to try it out on again. It’s also now modified so that it can use the surveyors tripod as it’s base rather than needing a table.